The SSMP and other documents describe an interest in a type of hydrodynamic test called a “scaled experiment,” which uses more special nuclear material and more closely resembles actual warhead designs. The public justification is to “improve confidence in predictive capabilities and help validate simulation codes,” but part of the reason is also that those codes will become less reliable if NNSA changes the warhead designs by adding new safety and security features during the Life Extension Programs. Every year, the United States conducts “hydrodynamic” experiments designed to mimic the first stages of a nuclear explosion. 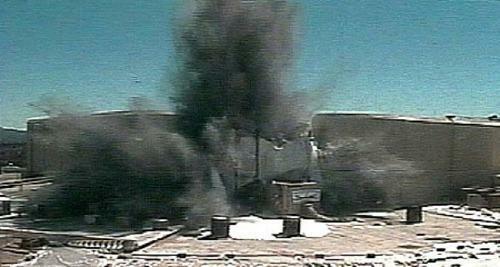 In tests, conventional high explosives are set off to study the effects of the explosion on specific materials. The term “hydrodynamic” is used because material is compressed and heated with such intensity that it begins to flow and mix like a fluid, and “hydrodynamic equations” are used to describe the behavior of fluids. In one type of hydrodynamic test, researchers build a full-scale primary—the first stage of a modern nuclear weapon—but the plutonium is replaced with a metal that has similar density and weight, but is not fissionable. The device is then fired, revealing information on the design’s behavior from the high-explosive detonation to the beginning of the nuclear chain reaction. A hydrodynamic test of the W76 warhead design is conducted at the Dual-Axis Radiographic Hydrodynamic Test (DARHT) facility at Los Alamos National Laboratory in 2005. Hydrodynamic tests using small amounts of plutonium are conducted underground at the U1a facility at the Nevada National Security Site (NNSS, formerly the Nevada Test Site), while others using surrogate materials occur at the Dual-Axis Radiographic Hydrodynamic Test (DARHT) facility at Los Alamos National Laboratory in New Mexico, and the Contained Firing Facility at Site 300 of the Lawrence Livermore National Laboratory in California. The tests vary greatly in scale and purpose (and there is some overlap) but fall into two overall categories: Integrated Weapons Experiments (IWEs) and Focused Experiments (FEs). Integrated Weapons Experiments (IWEs) use a rough approximation of an actual War Reserve warhead configuration, minus the special nuclear material. They can address many performance-related questions in one test. IWEs are used to validate modern weapon baseline models (the tested warhead designs) and are the most comprehensive tool for validating computer codes based on past nuclear weapon tests. Some IWEs involve “core punches” that use powerful radiographic imaging equipment to photograph the interior of nuclear weapon or surrogates’ components. 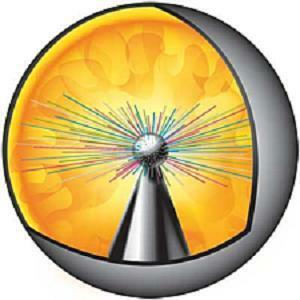 Others are “pin shot” experiments that use hundreds of fiber optic, electrical or other types of “pins” emanating from a center to determine features of the plutonium pit or a surrogate pit as it implodes (see image). In 2007, NNSA estimated that it needed to conduct approximately 10 IWEs annually to meet its programmatic needs. However, at the time, part of its program included development of the Reliable Replacement Warhead, which Congress cancelled in 2008. Focused Experiments (FEs) are smaller and less costly experiments than IWEs and are used to study and isolate issues related to specific components or materials used in nuclear weapons. FEs can be used to help validate computer codes and aid in advanced diagnostic development. In 2007, NNSA estimated that it needed approximately 50 focused experiments annually to meet its programmatic needs. When IWEs, FEs or small-scale experiments involve use of special nuclear material, usually plutonium, they are called “subcritical” tests. “Subcritical” refers to the fact that the amount of special nuclear material used is not enough to initiate a chain reaction. These tests are conducted at the underground U1a facility in Nevada. According to the nuclear weapons laboratories, hydrodynamic tests “provide essential data in developing and modifying weapons; such as Life Extension Programs” (emphasis added). As far as we can gauge, scaled experiments are subcritical, core-punch, hydrodynamic tests designed to conduct experiments in an implosion geometry that is essentially identical to an actual warhead design, but reduced in size. Rather than a full-scale warhead with the plutonium replaced by other material, a one-third to one-half scale model is built that does use plutonium. At a half-scale size, only one-eighth of the plutonium in an actual warhead is required. The smaller amount of plutonium keeps the explosion from beginning a nuclear chain reaction. Eventually, NNSA wants to build scaled experiments to almost three-quarters (0.7) the size of a full primary. Some NNSA officials claim to have conducted a scaled experiment in 2005, a claim that is disputed by others, including Administrator Tom D’Agostino.Some recent hydrodynamic experiments have involved scaled technologies. Since 2008, for example, Lawrence Livermore National Laboratory has carried out several experiments to study the size at which conventional high explosive boosters could ignite the main conventional high explosive that compresses the plutonium. The experiments have used half-scale IWE primaries to better understand how boosting of the warhead yield works as the gas cavity is compressed during implosion. One interesting note is that the push for scaled experiments is coming from NNSA officials, not the nuclear weapons laboratories. The labs have resisted because they are overburdened by the increasingly ambitious Life Extension Programs. NNSA officials claim that scaled experiments could yield ten times more data points and save money because one large scaled experiment could replace twenty of the smaller hydrodynamic experiments conducted today. Lab scientists maintain that scaled experiments would require major new equipment investments that are not currently planned. At present, U1a in Nevada apparently does not have the diagnostic equipment needed to harvest the additional data generated by scaled experiments. That sounds like a reasonable requirement to us. About the authors: Nickolas Roth is Policy Fellow for the Center for Arms Control and Non-Proliferation and a graduate student at the University of Maryland, Hans M. Kristensen is the Director of the Nuclear Information Project at the Federation of American Scientists, and Stephen Young is a Senior Analyst at Union of Concerned Scientists.